I met with a professor from one of the local universities the other day, and he articulated something that I’ve been thinking about ever since. We were talking about language teaching. When teaching your native language to non-native speakers, you are constantly being asked to explain why your language is constructed the way it is. To you, your language is constructed instinctively — you have a linguistic feeling that helps you choose which words to use when and in which order, and that’s why it’s so different to learn language in school than to learn it at the beginning of life. Explaining why that feeling exists to people who don’t already have it is one of the biggest challenges in language teaching. But, this teacher put it so brilliantly — when you’re forced to explain it, you begin to examine your own language from a distanced perspective: you see it not as your community of native speakers sees it (because they never have to examine the linguistic systems that they’ve always employed), but as a community of non-native speakers understands it. This distance, he argued, means that instead of speaking the way you have always spoken (out of instinct), you are more intentional about the way you speak. In other words, you start to form your very own language, which is not wholly determined by the cultural and linguistic community that surrounded you from birth. I find this to be linguistically true (I’m picking up both British-isms and French-isms already in the way I talk, which people at home might find bizarre), but I’ve also been thinking about it as true of the Self. When I went on study abroad, I envisioned myself as a living organism being plucked from its natural habitat and plopped in the middle of one that’s entirely new. Everything that my identity depended upon in my Whittie, Walla Wallan, Washingtonian, Redmondite communities (what I studied, who my friends were, my extracurriculars and leadership positions and what people knew of or assumed about my personality) no longer applied. I could reinvent myself if I wanted, because I became the only one responsible for inventing myself and articulating me to others. It was an incredibly scary step into the dark, to alienate myself from my safe, warm, and loving linguistic and cultural community. Just like I maybe am becoming estranged from Instinctive English, I became estranged from my old self. And I’ve done it again. 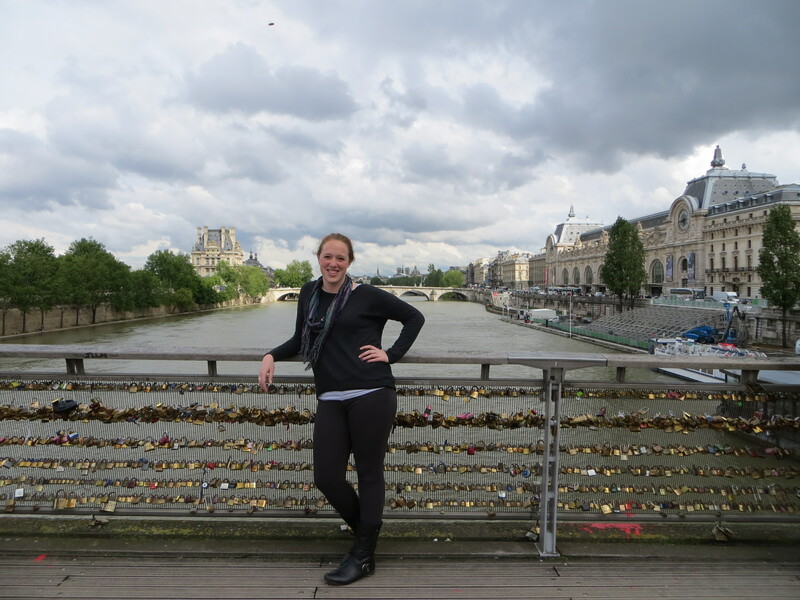 In Paris, my identity was somewhere between Tourist and Inhabitant, and it was my distance from both, being in-between, that helped me figure out where my niche lay in my life there. Now I’m sort of in one of life’s in-between spaces. I’m in between my educational career and my future as an adult in the working world. And there is no more congruous space to occupy, in this place in my life, than (once again) a linguistic and cultural in-between. I’m an American living in France, and I’m being forced to think about American-ness and French-ness, English and French, and who I’ve been and who I’ll be, all at once. I’m uncomfortable in almost all the roles — in one, and the other, and the in-between — but it’s when I’m uncomfortable all the time that I find I have the most to think about. And I find that when I’m not in a community that I naturally know how to fit into, I begin to understand myself in new ways. Being distant from what I’ve always known gives me that same distanced perspective on myself that I have on my language. Part of growing up is gaining a sense of identity, I think. Communities, both cultural and linguistic, give their members that identity, and mine has been profoundly shaped by where I’ve come from. But, where I am now is making me think about who I want to be next as only the destabilizing new identity of “foreigner” to a rich new community can. And thus, as we’re all shaped by our language, finding my autonomy in my language is helping me find my autonomy in my identity. I’m growing into an Anne of my own intentional creation. And I will continue growing in this way, forever. So I guess it’s best I learn how to do it, right now. And how to never let it stop!